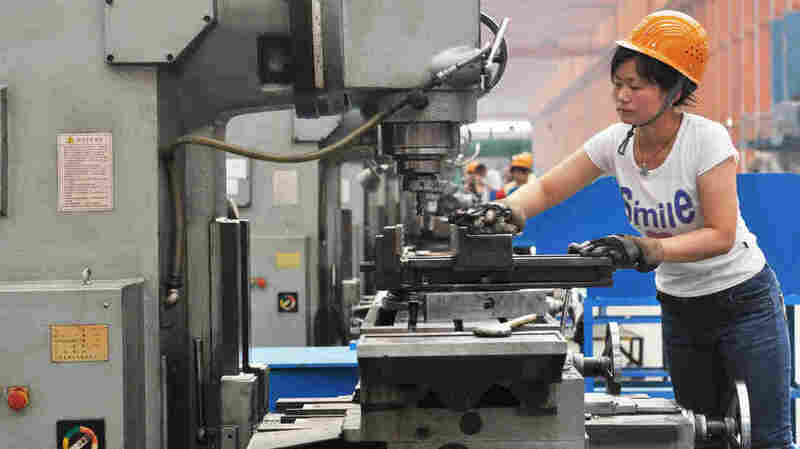 China's Economy Cools, Perhaps More Than Planned The country's economy has not only been slowing down recently — it's been slowing faster than expected. That's due largely to overly effective efforts by Beijing to rein in earlier blistering, and unsustainable, growth. Many say the downshift will continue unless the economy undergoes serious reform. 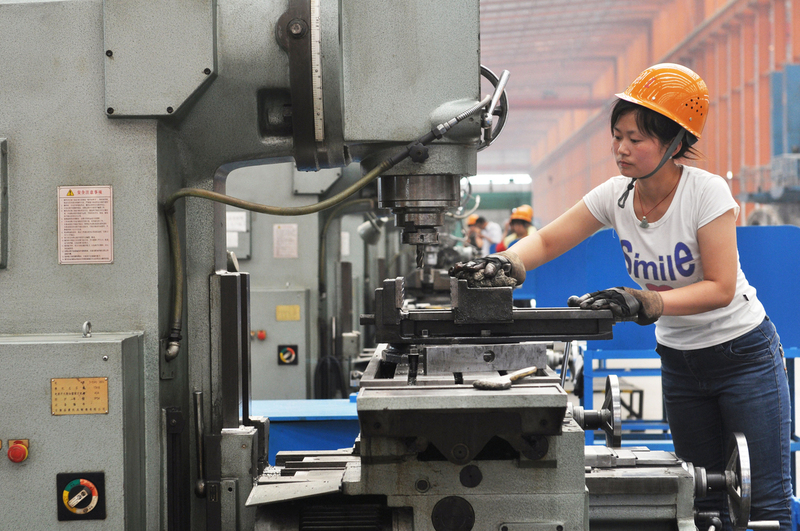 A Chinese worker operates a machine at a factory in Binzhou in northeast China's Shandong province. China's exports and imports shot up in May year-on-year, the customs agency said on June 10, defying expectations amid a slowdown in the world's second largest economy. In recent months, economic growth in China has not only slowed — it's slowed faster than most people expected. Last week, for the first time since the depths of the global financial crisis, the government actually cut lending rates to try to spur growth. All of this has people wondering: Where is the world's star economy headed? The sound bites from last week's news were dreary: "There's something of a cloud hanging over China's previously booming economy." ... "One adviser to China's leadership calls it a sharp slowdown." ... "Simply put, the world's second-largest economy is running out of steam." And they followed some concerning figures. In May, consumer prices fell well below government targets. This week, the head of a Chinese government think tank said growth from April through June could drop below 7 percent. Weakness has been showing up in various corners of the economy, including air travel. Brian Pearce, the chief economist at the International Air Transport Association, says air travel in China has been hit pretty hard. "For a number of years, we were seeing growth rates of 15, 20 percent," he said in Beijing, where he was attending the association's annual conference. "That seems to have slowed down quite sharply over the last year, and we're seeing growth rates down to single figures, which is quite strong for most markets, but for China, that's a pretty weak outcome." Most travel in China is for business, and many business people are anxious. "Confidence has been weaker, particularly among smaller business. Also, export business has weakened," Pearce says. "China has seen exports to Europe fall quite sharply because of the problems in Europe." The government tightened up a little too much in two areas: in the housing market and on construction of public infrastructure. When people talk about China's economy, they often focus on exports. But most of the things driving the current decline are homegrown. Andy Rothman, China macro-strategist for CLSA, an independent brokerage and investment group, says the slowdown promised by the Communist Party is under way. Rothman says China's blistering growth is no longer sustainable. The government has been trying to slow it down and improve its quality. The problem, he says, is that the Communist Party overdid it. "The government tightened up a little too much in two areas: in the housing market and on construction of public infrastructure," he says. The government put restrictions on real estate sales to bring down sky-high prices. But driving down sales also helped drive down demand for things such as steel and concrete — hurting factories. The government is now quietly encouraging some home buying and approving new public projects to help stabilize the economy. Last month, home sales picked up in major cities. If the government doesn't do anything to reform the current system, China's economy will be stuck in this structural downshift for quite some time. For many, many years. "We've got kind of a typical situation in China, where things don't work perfectly well but then the government comes in and fixes it pretty quickly," he says. "And now I think we're back on track to get just over 8 percent growth this year, which is what we expected at the start of the year." In the short term, Ren Xianfeng, a senior analyst with IHS Global Insight in Beijing, is upbeat too. "If you ask me to look at the next six months, I'm optimistic, because everyone is in panic mode now," she says. But she's more pessimistic about the medium and longer term. That's because China's economy needs serious reform, Ren says. To keep growth going, the government needs to build a more innovative economy, one that doesn't favor state-owned companies so much and does more to help finance private firms, which create most of the jobs in China anyway. "If the government doesn't do anything to reform the current system, China's economy will be stuck in this structural downshift for quite some time," she says. "For many, many years." After decades of spectacular growth, that would be a shock — and something no one wants to see.